Apart from all the historic wonders in Rajasthan, it is also house to the World’s second longest wall next to the Great Wall of China. The Kumbhalgarh Fort located near Udaipur is a historical marvel that has stood the test of time witnessing many historic events. 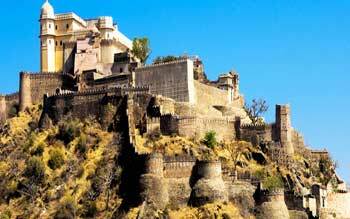 The Kumbhalgarh Fort is a Mewar Fort build on the Aravalli Range near Udaipur. Camouflaged by the surrounding hills in the Aravalli Range makes the Kumbhalgarh Fort an impregnable one. Being the birthplace of the brave Maharana Pratap, this fort was never won in Battle but captured in a deceitful manner by the Mughals when they poisoned the water supply to the Fort. The Fort was built in a clever manner in which to defeat enemy invaders. The Fort houses Badal Mahal, Kumbha palace and the Neelkanth Temple with its huge dome and intricately carved ceilings stooped upon 24 pillars. Kumbhalgarh Wildlife sanctuary, Muchchal Mahavir temple and Ranakpur Jain temple. The months of October to February offers a pleasant climate to visit the fort. By air :The nearest airport is Udaipur Domestic airport which connects to Delhi, Mumbai and Jaipur. By train :Falna is the nearest place with a railway station. By road :The nearest bus facility available is at Nathdwara which is 36 kilometers away. One has to hire a taxi to reach the Fort.